$40 day of event. If ticket was purchased today (day of event), ticket must be checked-in at BRAVO BRAVO or PUBLIC BAR. 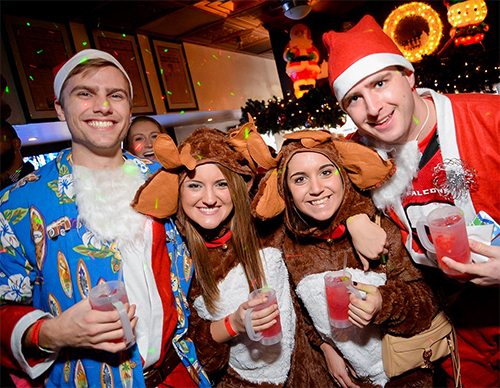 DC Santa Crawl is a winter/holiday season themed bar crawl based in Washington D.C. Thousands of participants will quench their thirst on exclusive drink deals as they explore D.C. and celebrate the holiday season one bar at a time. What you get: A refillable signature Santa mug, access to some of Dupont's best bars, exclusive drinks & food specials and a raffle entry to win great prizes. Participating Bars: The Front Page, Sign of the Whale, James Hoban's, Ozio, 1831, Public Bar, The Bottom Line, Cafe Citron, The Madhatter, Bravo Bravo, Abigail, City Tap House, Recessions, District Anchor, The Madhatter, Nero DC, Meeting Place DC,and more bars to be announced! Dress Code: Participants are encouraged to dress in whatever best expresses the holiday season, whether it be a full-body candy-cane suit, a snuggle turtleneck, or tinsel-streaked hot pants. You must be 21+ to participate. Please drink responsibly. Event Guidelines & Terms (Check box after read) By proceeding with registering for the event, you acknowledge and agree that you have carefully read and fully understood the waiver and agree to the terms set forth below. 1) I certify that I am at least twenty-one (21) years of age and that if I choose to consume alcoholic beverages, I will do so responsibly. 2) I voluntarily, knowingly and freely assume all risks associated with attending The DC Santa Crawl in Washington, DC and entering the premises, including, but not limited to, my own actions or inactions, injuries, illness and contact with others. 3) Project DC Events may dismiss me, without a refund, should my behavior endanger the safety of or negatively affect the event, premises, or any person, facility or property. 4) I understand and agree that all ticket purchases are final and non-refundable. 5) I understand and agree that I must posses a valid government ID to get access to the participating premises. 6) I understand and agree that an event ticket may be used by someone other than the purchaser. 7) I understand and agree that I don't bring my ticket the day of, I will not be allowed into the event. 8) I understand that the event and it's activities may be photographed and/or video recorded. I agree to grant Project DC Events LLC the rights to use any photographs, video recordings, and/or sound clips taken of myself during the event for any all promotional, advertising and/or trade purposes, without compensation, notification, or permission.